I bought an Ice Cream Maker!!! 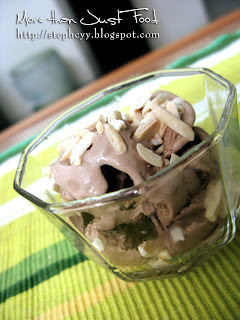 Finally ♥~ It's not very popular to use an Ice Cream Maker to make your own Ice Cream at home. Maybe cos' Malaysia is just waaaaayy too hot. Oh Well, I'm just too disappointed about the ice cream sold in the market right here. Flavor is limited... quality is hardly up to standard... *sigh* So I'm making my own ice cream~ Yay!! In a medium saucepan, mix milk and milo. Warm until foam forms around the edges. Remove from heat. In a large bowl, beat the egg yolks and sugar until frothy. Gradually pour the warm milk into the egg yolks, whisking constantly. Return mixture to saucepan; cook over medium heat, stirring with a wooden spoon until the mixture gels slightly and coats the back of the spoon. If small egg lumps begin to show, remove from heat immediately. Pour the mixture through a sieve or fine strainer into a bowl. Mix cream into the custard. Cover, and chill for several hours or overnight. Pour the mixture into an ice cream maker, and freeze according to the manufacturer's instructions. Transfer to a sealed container, and freeze until firm. If the ice cream is too firm, place it in the refrigerator until it reaches the desired consistency. Try making Vanilla mixed with Cocoa Powder and Raisin. Awesome wei. If rajin then make the vanilla ice-cream from scratch, and add the raisins and cocoa powder. By the way Van Houten cocoa powder is good.